Nicosia, the Capital of Cyprus, and the only divided city in the world is situated in the centre of the Mesaoria Plain, there is nothing of interest in the immediate vicinity, picturesque towns and villages are some miles away and a trek into the mountains either to the south west or the north is a lengthy drive. Thus, it is probably not best described as a holiday destination. However what it does offer is the chance to explore some fascinating history all encompassed within the circular perimeter of the city walls. Because of the border that runs through the centre it is easy to use the divide in the planning of two good walks that will reveal the best and most fascinating aspects of this city. 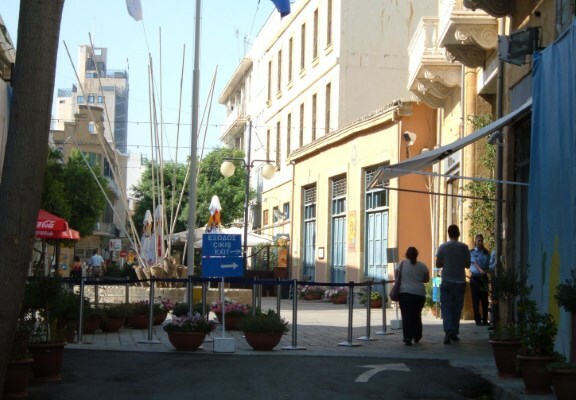 A basic outline of the history will be an added benefit and permit the first glimpse of how long Nicosia has been inhabited. 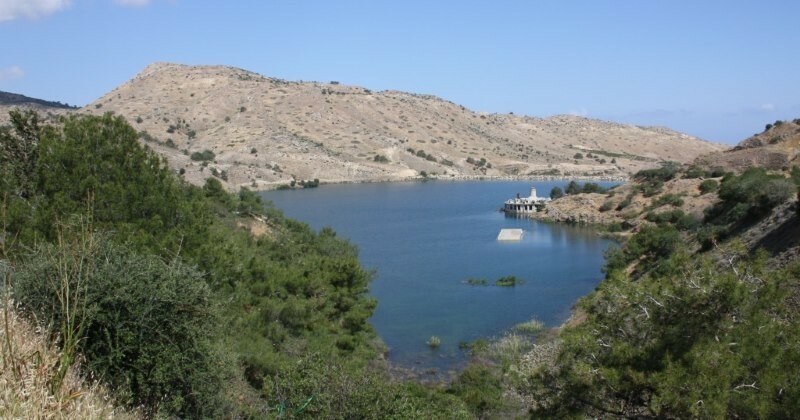 Most historians agree that there were inhabitants of a small township as far back as 5000BC that had the name of Ledra. Under the Ptolemaic Greek rulers of Egypt, it was named after the Ptolemy Lefkos, and continued to be of little importance. There were no further changes to the name under the Romans or Byzantines and it was not until the coastal raids took place in the 7th C AD that the town achieved some prominence when it was deemed by the populace safer to live inland than on the shore. Under the Lusignan dynasty, (the French rulers from the Poitou region of France,) the town became known as Nicosia. Whether this was because of some inability, or reluctance on the part of the French to pronounce the name Lefkosa is not known, and it has remained so ever since, with slight variables of the original Lefkos, in the Turkish and Greek spellings, Lefkosha is Turkish, Lefkosia is Greek. The history of the past is long and complicated and there is evidence of this down every narrow street, in the massive fortifications, the museums, the mosques and churches. Modern times have not left it unscathed, hence the divide instituted in the 1960’s that bisects the city into two segments that mirror each other in so many ways. For the purposes of exploration I have mapped out two walks, to cover north and south Nicosia separately, there is no political reason for this, it just makes it easier. What follows is the itinerary of a walk through the back streets that I did for many years between the months of October and May (in summer it really is too hot) and with the aid of a good map, mark out the following main places of interest, and then see as much or as little as may appeal. Starting at the Kyrenia Gate, make for the Yeni Camii (new mosque), from there continue to: the Lusignan House, the Haydar Pasha Mosque, (Church of St. Catherine), the Eaved House, the Bishops’ Palace, Selimiye Mosque, (St. Sophia), the Bedestan, the covered market, the Buyuk Han, the Buyuk Hamam, the Arasta Bazaar and Lokmaci border crossing point, Dervish Pasha Mansion, Salahi Sevki Sokak (Victoria Street), the Armenian Church of Our Lady of Tyre, and the restored Armenian Theatre, the Catholic Church of the Holy Cross (visible on the other side of the divide), up Pasha Street through Tanzimat Square and onto the Roccas Bastion, follow the city walls north along Tanzimat Street and continue, passing the Presidential Residence on the way, returning to the Kyrenia gate, deviate slightly into the Samanbahce complex and finish the walk at Ataturk Square with a cooling drink on the eight floor of the Saray Hotel. This is a walk that will take about three to four hours without any museum visits, or all day depending on how intensively the above places of interest are viewed. There are plenty of cafes for refreshment along the way and shops selling everything from spices and souvenirs to vegetables and clothing. This is one of the three main gates constructed by the Venetians during the remodelling of the city. Originally there was just the arched entranceway through which a laden camel could pass. The dome was added by the Ottomans and housed a watchman. There is a verse from the Koran that reads: “O Mohammed, give these tidings to the faithful: victory is from God, and triumph is near. O opener of doors, open for us the best of all doors,” and a Latin inscription stating 1562 as the date of construction, set into the walls. During British rule the massive walls on either side were breached to facilitate the access of vehicular traffic, leaving the original gate set on a central island. Rather than continuing down Kyrenia Street (Girne Caddesi) towards Ataturk Square, the Venetian Column and The British Colonial period offices, turn left after the Whirling Dervish Museum into Fellanlar Sokak and make for the Laleli Mosque, this was a medieval chapel converted to Islam with the addition of a decorative minaret in the shape of a tulip (Laleli). Continue on through the winding streets until a large school is reached and in the corner of the playground are the remains of the Yeni Mosque. Only the stump of one tower is left of this 14th C church that was converted into a mosque that remained in use until its collapse in the 18th C. A popular local legend says that the church was rumoured to contain hidden treasure and such was the greed of one Pasha that he systematically destroyed the church stone by stone in his search for the fabulous riches. His avarice went unrewarded and as punishment he was made to build the small mosque that stands nearby that is still in use for worship today. His tomb is adjacent. The Lusignan House is about 100 metres away and is one of the finest examples of Lusignan residential architecture in the city. The coats of arms over the main street entrance have been defaced bar one and this is probably of the Rocheouart family. There have been Ottoman additions, most noticeably the “Kiosk” that hangs over the street. In the 1950’s the house was lived in by a family of Russian émigrés called Classen and it was used as a weaving workshop. After partition of the city it was used by refugees and was eventually evacuated in the late 1980’s. In 1997 after extensive restoration that included the detailed repair of the beautiful Ottoman period ceilings the house was opened to the public. It is decorated with reproduction furniture of the Lusignan and Ottoman eras. Haydar Pasha Mosque (Church of St. Catherine) This 14th C Gothic classic is a gem, a beautiful, single-aisled church, with the usual additions that occur with the conversion of church into mosque. Apart from the minaret, the external appearance has changed little and the church has retained its elegant simplicity. The west portal has a triple columned door jamb, the centre column made of white marble and there are three defaced shields. The tympanum is filled with foliar tracery and the hooded corbels each have a decorated pinnacle. Currently the building is used intermittently as a gallery but opening times are erratic. The “Eaved House” is another restored building dating from the middle ages that is now used as an art gallery and cultural centre. It is to be found in the S.E. corner of the pedestrian precinct that surrounds the Selimiye Mosque. Called the “Eaved House” because of the deep overhang of the roof, this is an L-shaped two storey dwelling with an inner courtyard. The ground floor consisted of the domestic quarters and the upper floor contained bedrooms and reception rooms. The house underwent major repair in the early 1930’s and it was fully restored during the 1990’s, the restoration project has encompassed the different periods of occupation, including the creation of the main receiving area complete with charcoal brazier. Opening times are subject to museum hours, except during major exhibitions. The Bishops’ Palace situated on the north side of the Selimiye Mosque (St. Sophia Cathedral) pedestrian precinct, is an early to mid 13th C building erected during the time of Bishop Eustorgius and further modified by successive incumbents. It was heavily damaged by Orthodox believers in 1313 who were incensed by the increasing taxation imposed by the Latin church and was sacked again in 1458 during the closing stages of Lusignan rule. There are shields from the French period on the south facing wall and an escutcheon showing the fleur de lys and the bishop’s mitre. After the Ottoman conquest the house was taken over by an Ottoman judge who made various changes to the upper floor turning it into a mansion in the Turkish style. It became the Governor’s house of Kucuk Mehmet Pasha from 1821-1826 and remained as the Governors’ house until the British takeover on 1878. In 1925 the building was handed over to the Education dept. and it became the Saint Sofia Primary Girls’ School. It was transferred to the Organization of Turkish Municipalities in 1984 and restoration work was carried out in 1985. Since then further restoration work has been carried out under the Nicosia Master-plan Restoration scheme. The foundation stone of this great church was laid in 1209 under Archbishop Thierry but due to financial constraints the work was not completed until 1326. 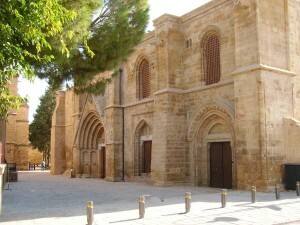 The principal scene for coronations of the Lusignan rulers, St. Sophia was the most important Catholic Church on Cyprus. It suffered heavy damage during the Genoese invasion of 1373 and by the Egyptian Mamelukes in 1426. When the Venetians took over the island, they confiscated all the church treasure to help pay for the extensive restructuring of the city. Further damage was done to the fabric of the building during the earthquakes of 1491 and 1547. (Strain gauges can be seen on all the cracks in the walls to monitor movement of the building.) The last Catholic mass was said by Francesco Contarini the Bishop of Paphos on 9th September 1570. With the success of the Ottoman conquest all traces of popery were removed and destroyed. The statues and stained glass windows were smashed beyond recognition. Many tombstones of previous monarchs and their rich and powerful supporters were taken up and replaced in the floor inscription side down. The bodies that had been interred beneath them were thrown out into the street to be trampled by the populace. The church was then converted into a mosque. It continued to be called Ayasofya until the name was changed in1954 to Selimiye in honour of the Sultan Selim II who led the conquering Ottoman forces to victory in 1570/71. Recently restored in part and converted into a conference centre this Orthodox complex combines Byzantine, Gothic and Renaissance architectural designs. It is the amalgamation of two churches, one dedicated to St. Nicholas of the English and the other to The Blessed Virgin Mary. Look at the two north facing doors. The one to the east has a carving of St. Nicholas and the one to the west a carving of the dormition of the Blessed Virgin. At one time this was the Orthodox Metropolitan building for Nicosia and underwent a change of use when the Ottomans took control. It became known as “Bedestan” and has been used through different periods as a flour market, a textile warehouse and a general purpose covered market before falling into ruin and disuse. The Buyuk Han or Great Inn is the most impressive piece of Ottoman architecture on the whole island. Built in 1572 by Mustafa Pasha it is a caravanserai for traders. The original motel for travelling salesmen! It has two main doorways, one to the east and one to the west, both of them large enough to take a well laden camel. There are two storeys of apartments with fireplaces to provide warmth and comfort, and in the centre of the courtyard is a small raised mosque with ablution facility beneath. There would have been camel stables nearby but no trace remains today. Currently the building is used as an arts and crafts retail centre. There are many souvenir shops that sell everything from postcards and stamps, to lace, pottery, original artworks, jewellery etc. There is also a cafe that provides the usual refreshments of tea, coffee, beer and soft drinks. It also serves delicious Cypriot sweet and savoury pastries that are made on the premises. The textile and jewellery centre of Nicosia is in this area and adjoins the Buyuk Han. At the bottom of a slight hill where five streets converge is the Lokmaci border crossing point. The Dervish Pasha Mansion constructed in 1829 this house was the home of Dervish Pasha who published “Zaman” the first Turkish newspaper in Cyprus. Restoration was carried out between 1978 and 1988 and the house is open to the public as an Ethnographic museum with a series of rooms laid out in different domestic scenes. Turn right from the Dervish Pasha Mansion into Salahi Sevki Sokak, called Victoria Street prior to partition, then turn left and walk into the Armenian quarter. There are some impressive houses in this street and the majority of them have been, or are at present being, restored. 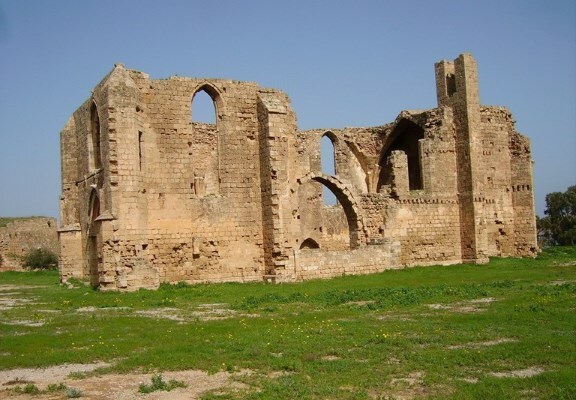 Regrettably, in an almost totally ruined state and with a very long period of restoration ahead of it, is the Armenian church of Our Lady of Tyre. Built in the 14th C very much in the Gothic style, this church was part of a nunnery complex that was founded for the order of nuns forced to flee from the Holy Land when Jerusalem fell to the Saracens. Originally a Catholic Church, after the Ottoman conquest it was handed over to the Armenians who came to live in this part of the city. However it was abandoned when the city was divided in 1964 and has slowly crumbled during the intervening years. The Armenian Theatre (Arabahmet Culture and Arts Centre) this complex has been completely renovated as a self contained culture venue. There is a well equipped theatre, meeting rooms and exhibition hall and there are some beautifully restored Ottoman ceilings. The barrier at the end of Victoria Street is one of the original crossing points from 1964. 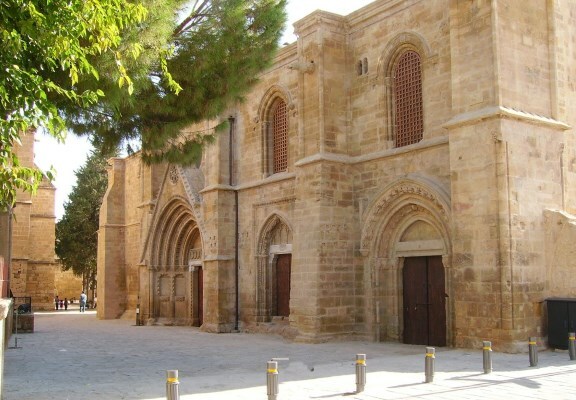 It remains closed at present but on the other side can be seen the Church of the Holy Cross which can be visited during the South Nicosia walk. From the Armenian theatre cross Victoria Street into Pasha Street or one of the others that run parallel. These narrow streets have all had their house facades restored, the roads have been paved and there is supposed to be no vehicle access. These small houses are mostly made of mud brick which makes them cool in summer, warm in winter. They nearly all have small courtyard gardens at the rear. The streets join Tanzimat Square, where there is a car park and a good view over the city walls to the Ledra Palace Hotel, now the UN headquarters. Turn left from the car park and walk onto the top of the Roccas Bastion. This is a shady area of pine trees and plenty of benches surrounded by a high wire perimeter fence that prevents access to the southern part of the city. The Paphos gate is on the other side, as is the road that leads from the north to the south via the Ledra Palace border crossing point. Returning to Tanzimat Square follow the line of the city walls all the way to the junction with Zehra Sokak where there is a dry fountain dating from 1910. A road comes into the city from the left (built over the walls by the British), cross this and continue, passing the Presidential Residence on the way and the Kyrenia Gate is at the bottom of the hill. Extending the walk a little further, just before reaching the Kyrenia Gate, turn right into a car park and enter the Samanbahce complex. Built at the end of the 19th C this was a community housing project to support poor families. The first phase was completed in 1900 but the entire enterprise was not finished until 1955. It consists of 68 terraced houses built in nine groups and was constructed on the site of a fruit and vegetable garden, hence its name. The restoration process took place during 2003/2004 with repairs being carried out to the facades, and improving the streets and utilities. At the exit of the complex turn left into Girne Caddesi (Kyrenia Street) then right into Ataturk Square, here is the granite column erected by the Venetians as symbol of their dominion, the law courts built by the British and the Saray Hotel. There is a fee to use the lift of the hotel to the 8th floor but it includes a much needed drink, the view across the city is truly panoramic and it is a good place to end a long walk.